The high country in Victoria gets pretty cold this time of year and it was nice to be able to throw on some gear and not have to worry about adding any more layers. The thermal liners in both the jacket and the pants did a fantastic job of keeping me warm. When it warms up, the liners zip out in seconds and can be stored away in the large cargo paocket on the back of the jacket. Even though the jacket and pants have three detachable layers and seem a little bulky, they’re comfortable and easy to move around in, on and off the bike. The stretch material in the arms, back and knees definitely helps, too. 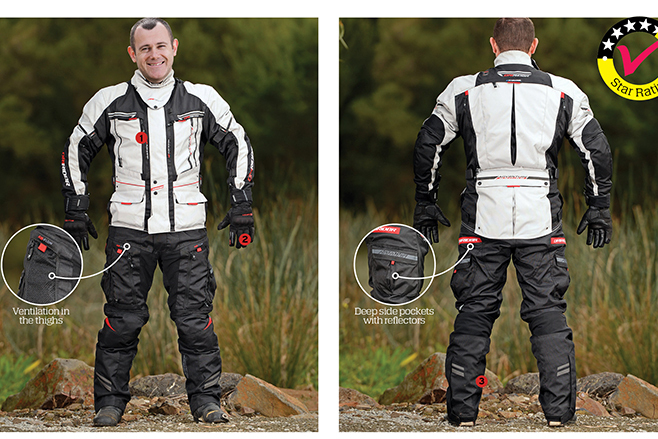 There’s also plenty of protection with CE-approved armour provided in the elbow and shoulders in the jacket and a lightweight back protector. And the pants have CE-approved armour in the kness along with lightweight hip protection. The removable neck collar got a bit annoying at times when looking through corners; I found it irritated my neck as I turned my head, so I opted to wear a neck warmer underneath to alleviate the itch. When it comes to gloves, it’s always a trade-off between warmth and feel, and the Dririder Adventure 2 gloves fit somewhere in the middle of the spectrum. They offer plenty of feel and have a Thinsulate thermal liner inside with a Hipora waterproof and breathable membrane providing adequate warmth and rain protection. And, unlike some other types of gloves, there’s no problem getting them back on if you find yourself with wet hands. On top of this, there’s the handy TPR visor wipe, which is far from just a gimmick – it really is great for keeping your visor clear. Check out the video review on amcn.com.au for more details on all this gear.